NY: D. Appleton & Co, 1894. engraving of Black River, near Elyria, Ohio, showing a canoe on the river with two fishermen on shore. Nice for framing..... 1st. Unbound. Very Good. Illus. by Artist Unattributed. 6" x 6.25". 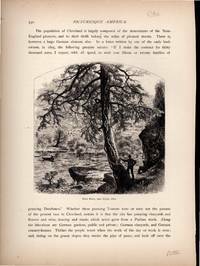 NY: D. Appleton & Co, 1894. lovely engraving of the rock formation called Lovers' Leap with two hunters below...Nice for framing..... 1st. Unbound. Very Good. Illus. by J. Douglas Woodward. 6" x 6". 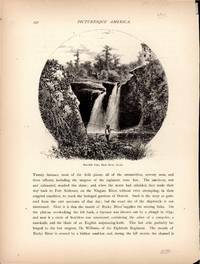 NY: D. Appleton & Co, 1894. engraving of the Red mill Falls, Black River, near Elyria, Ohio, showing the falls with a fisherman in the foreground. Nice for framing..... 1st. Unbound. Very Good. Illus. by Artist Unattributed. 6" x 6.25". NY: D. Appleton & Co, 1894. lovely engraving of the City of Detroit from the viewpoint of a balcony at city hall, with a man and his dog...Nice for framing..... 1st. Unbound. Very Good. Illus. by Artist Unattributed. 9" x 12". 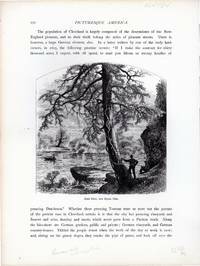 NY: D. Appleton & Co, 1894. lovely engraving of the rock formation called "Fairy Arch near the Straits of Mackinac. [Reverse side is Sugar-Loaf Rock (East Side) (Mackinac Island, Michigan)"...Nice for framing..... 1st. Unbound. Very Good. Illus. by J. Douglas Woodward. 7" x 7". NY: D. Appleton & Co, 1894. lovely engraving of the Arched Rock with the moon shining and one lone hiker...Nice for framing..... 1st. Unbound. Very Good. Illus. by J. Douglas Woodward. 6" x 8.25". London: Illustrated London News, 1848. 2/3 page report on the funeral of f Louise Marie Adélaïde Eugénie d'Orléans, the sister of the French King, and member of the House of Bourbon., along with an engraving showing the funeral service in progress. Unbound. Very Good. Illus. by B/w Engavings. 10.5 x 15.5. London: Illustrated London News, 1848. 1 1/4 page obituary of Louise Marie Adélaïde Eugénie d'Orléans, the sister of the French King, and member of the House of Bourbon...illustrations are a portrait of the late Madame Adelaide, and the Chapelle Ardente, and the Late Madame Adelaide's chateau, Randam.. Unbound. Very Good. Illus. by B/w Engavings. 10.5 x 15.5. NY: Chartwell Books Inc, 1986. in very good slipcase, with mar on the bottom from price removal, else near fine. 1st. Hardcover. Near Fine/Near Fine. Folio; 9 Pounds. NY: Dover Books, 1970. Dover reprint of 1883 edition In pictorial wraps...c.886 pages, clean, unmarked. Paperback. Very Good. Illus. by over 1400 Illus. folio. 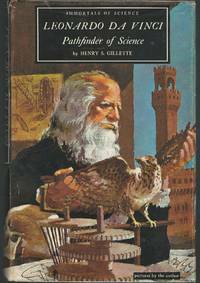 Da Vinci, Leonardo) Gilette, Henry R.
NY: Franklin Watts, 1962. dj w/lite wear only; 168 clean, unmarked pages; lite mottling of covers; illustrated end papers; book club. Hardcover. Very Good/Very Good. Illus. by Author Illus. 12 vo. NY: Viking Press, 1938. 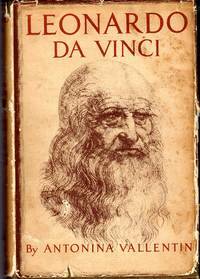 First Edition, First Printing; dj w/chipping, small tears, price clipped; 561 clean, unmarked pages. 1st. Hardcover. Very Good/Good. Illus. by B/W Illus. 8 vo. NY: Modern Library, 1955. dj w/lite chipping, unclipped price, in mylar; 736 pages (#158 in series, lists to 408 on dj reverse). Hardcover. Very Good/Very Good. 12 vo. NY: Franklin Watts, 1962. dj w/lite wear only; 168 clean, unmarked pages; illustrated end papers; book club. Hardcover. Very Good/Very Good. Illus. by Author Illus. 12 vo. Chapel Hill, NC: Algonquin Books, 1987. dj w/unclipped price; 193 pages/index/bibliography; Account of feuds between Richmond, VA newspaper editors before the Civil Wa. 1st. Hardcover. Near Fine/Near Fine. Illus. by B/W Illus. 8 vo. NY: Doubleday & Co, 1978. 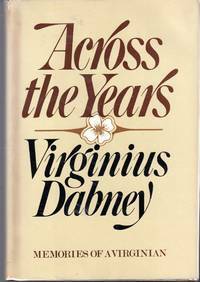 First Edition, First Printing; dj w/clipped price, in mylar; ;420 clean, unmarked pages; owner's insc.. 1st. Hardcover. Near Fine/Near Fine. Illus. by B/W Photos. 8 vo; 1.5 Pouinds. Chapel Hill, NC: Algonquin Books, 1987. 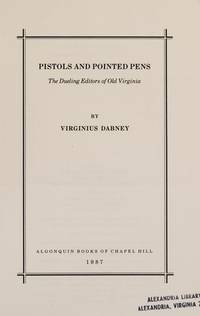 First Edition, First Printing; dj w/unclipped price, in mylar; 193 pages/index/bibliography; Account of feuds between Richmond, VA newspaper editors before the Civil Wa. 1st. Hardcover. Near Fine/Near Fine. Illus. by B/W Illus. 8 vo. 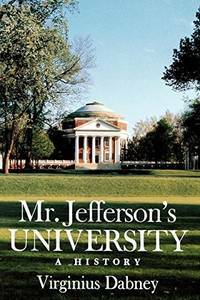 Charlottesville, VA: University Press of Virginia, 1988. First Edition, Thus; 598 clean, unmarked pages . 1st. Paperback. Very Good. Illus. by B/w. 8 vo. Chapel Hill, NC: Algonquin Books of Chapel Hill, 1987. 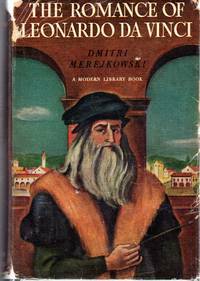 First Edition, First Printing; 193 clean, unmarked pages . incl.bibliography, notes,index. Description of newspaper editors of VA Commonwealth before the Civil War through 1880's; dj w/price clipped, in my lar.. 1st. Hardcover. Near Fine/Near Fine. 8 vo; 1.5 Pouinds.